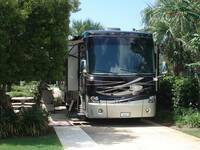 Here at Destin RV Beach Resort, we offer 36 beautiful landscaped RV lots that can accommodate RV's of all sizes. Each site has all utilities, 30 and 50 amp electrical, cable TV and there is WiFi throughout the resort. A cement picnic table, benches and patio light round out the amenities at each site. Enjoy the emerald waters and white sand beaches of the Florida Panhandle from a clean, comfortable and private setting at Destin RV Beach Resort. We cannot promise you a specific site when you book, but we will attempt to accommodate your requests. Please list your needs in the "special requests" section of the online booking site or simply ask when you call. Note: All RV sites will accommodate your RV and one vehicle. Free parking for extra vehicles, and paid parking for trailers is available across the street upon request.